Pickling is the only practical way to preserve cucumbers. They don’t freeze or dry well. You can make “quick process” bread and butter pickles from slicers, but their slices wouldn’t stand up to a fermented pickle process. Pickling Cucumbers also have skin that is less bitter, and undeveloped seeds. They can be pickled whole or sliced lengthwise into spears. Unlike slicers, they are sold unwaxed. 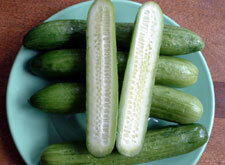 The skin can’t be waxed, because that would prevent the pickling solution from getting into the pickle past the skin. Generally, they are sold harvested when 3 to 4 inches (7 1/2 to 10 cm) long. Once the cucumbers have started growing, they grow in size quickly, so they have to be picked every day to prevent them from growing past the optimum size. As well, if even a single one is left on the plant to fully grow and ripen it to yellow, the plant will figure its job is done, and it will stop producing any more. They are graded by diameter to length ratio, good colour, firmness, straightness, etc. Some people, when they have to wash large quantities of pickling cucumbers, put them in their clothes washing machine, with no soap (obviously), on gentle cycle. The above are all vine-type plants except where bush-type is noted. Liberty is now (start of the 2000s) a very popular one with commercial growers. On average, as a very rough guideline, expect to need about 500 g (1 lb) of pickling cucumbers per 1/2 litre (US pint / 500 ml / 16 oz) jar, if quartered. 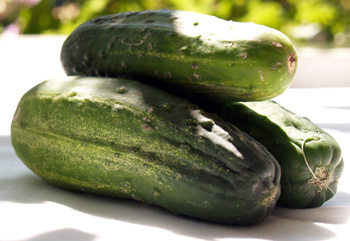 If kept whole, expect to need about roughly about 500 g (1 lb) of pickling cucumbers per litre (US quart) jar.